Sea turtle nesting season is upon us and that means lights out! : Atlantic Yacht & Ship, Inc.
Sea turtle nesting season is upon us and that means lights out! Sea turtle nesting season is upon us and that means lights out near the beaches from May 1 to October 31, 2018. Local ordinances designed to protect sea turtle nesting, require all indoor and outdoor lights that are visible from the beach to be turned off from 9 p.m. to 5 a.m. Artificial lights from housing and condominiums can confuse the sea turtles, as they use the light of the moon to direct them to the ocean. First, a female sea turtle comes to shore and looks for a suitable location for nesting. If she is satisfied, she will start digging a whole to lay her eggs in. The female sea turtle will then cover the hole and head back to to the water. She continues life without ever meeting her babies. Comparatively, when a female sea turtle comes to shore and is disturbed or can not find a suitable nesting location, she turns around and heads back to the water. This is a false crawl. Unfortunately, these turtles will end up releasing their eggs in the water reducing the eggs survival rate. Hatching happens approximately after 48-55 days of incubation. The babies will make there way up through the sand in masses and head towards the water. The babies use their natural instinct to follow the light. The light being the moon’s reflection against the water. Conservation programs set in place allow officials to monitor sea turtle nesting with surveys every morning. 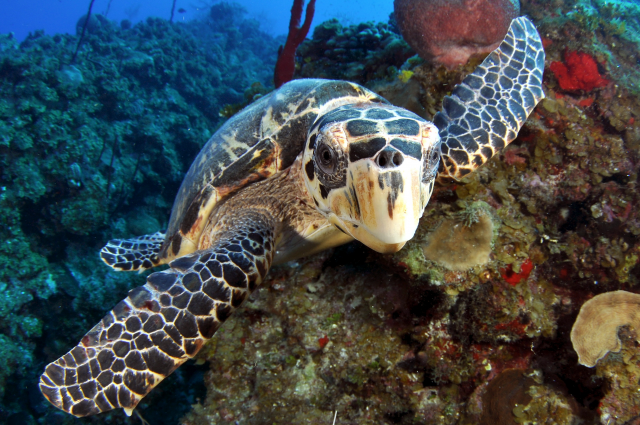 Surveys document the total number of turtle nests, turtle species and false crawls. Placed at all nest sites, are secure marking devices. In addition, certain areas of the county have cages placed around the area to keep foot traffic away.